Water-Cooled chilling modules are stationary units designed to provide chilling capacity to new or exsiting central chilled water systems. The refrigeration system remain indoors while the remote air-cooled condenser is located outside the production facility. 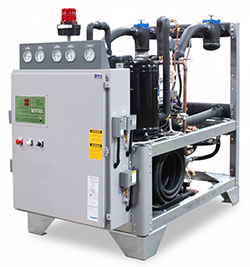 MW Series central chillers require an external reservoir and pumping system.